Since the new game of Attack on Titan recently launched, I decided to write a review on the first season of Attack on Titan which I also recently finished. See? It all adds up. (Smiley Face) This is Attack on Titan Season One. 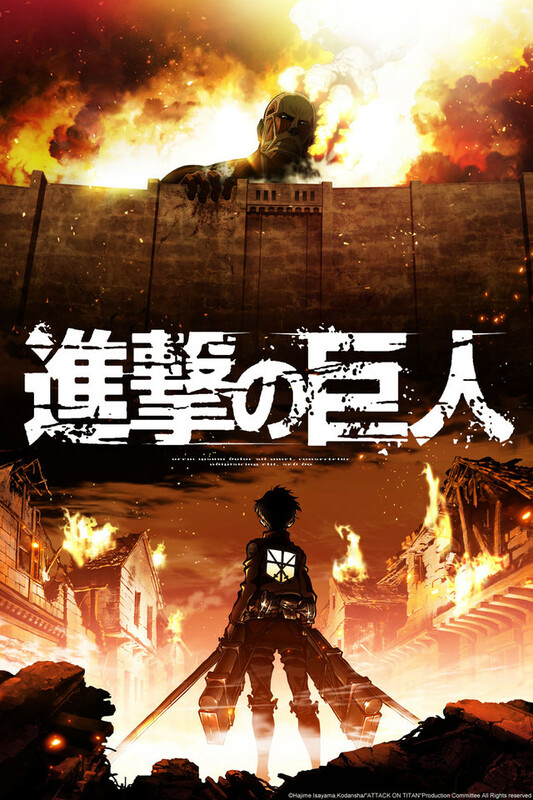 The basic story revolves around three childhood friends: Eren, Mikasa and Armin who live in the last bastion of humanity surrounded by three enormous walls. Outside the walls reside the Titans which are a group of gigantic monsters who have regenerative properties and a need to eat humans. The prologue begins when a never before seen Titan destroys part of the first wall defending humanity and lets other titans out. This action solidifies Eren’s hatred for these monster. The anime then skips to the three protagonists training and eventual graduation into the armed forces of the city. As this happens, the Titans will attack once again and the protagonists will need to use all of their talent and willpower to stave off extinction. So? Is the anime good? Yes but it does have some faults that I want to discuss. First, the pacing of the anime can be a bit… off at times. While this is an action heavy anime, there are moments where there is no action and just words. Unfortunately some of these segments turns into melodramatic dialogues that ruin the pacing and the tone of the story. Comrades defending each other in a war trial sounds good on paper but the execution just doesn’t mesh well with the other episodes. While it isn’t a constant problem, it happens frequently and noticeably enough to warrant mention. Other than some other minor faults, this is my biggest problem with this anime but for now let’s focus on the good things. What Attack on Titan does well, it does it really well. The animation during the action sequences is superb with it giving the normally the static panels of the manga a sense of movement and energy not seen in its original form. The episodes dealing with the aftermath of the battles are the highlight of the non action episodes due to the characters reaction to the events. Spoiler alert: these episodes are pretty dark in general with them dealing the horrors of death and failure rarely seen in typical shonen works. Thankfully the show balances the shonen and seinen aspects pretty well by having numerous shonen archetypes (Eren being the shonen typical hero) with seinen characteristics (Eren being a particularly bloodthirsty protagonist). The plot twists works well enough with the revelations coming slowly but still having its impact. In summary, the anime is a well made shonen/seinen dark fantasy series that falters a bit with the pacing of the dramatic episodes. Other than that, the series does it job of portraying this dark medieval world with horrifying monsters and a mystery that won’t be unraveled for some time (at least in the anime). The characters are familiar but not cliched. The voice acting is on point. The animation is smooth and energetic. At the end of the day, this is a slightly over hyped anime series that is actually quite good but you have to power through some very slow and overly dramatic sequences to get the good stuff. I agree that the biggest issue with Attack on Titan is the pacing. It goes at breakneck speeds and then stalls and repeats so many times. Otherwise, it’s a really enjoyable watch. No problem. Just wanted to put my two cents in the whole Attack on Titan conversation.